Eugene Joseff was the custom designer on over 1000 films before his untimely death in 1948. Upon Eugene Joseff’s passing, his wife J.C. continued the company’s relationship with Hollywood by serving as costume jeweler on over 450 films until 2006. This collection encompasses exquisitely crafted pieces worn by Hollywood’s most legendary stars in some of the most iconic films of Hollywood’s Golden era. 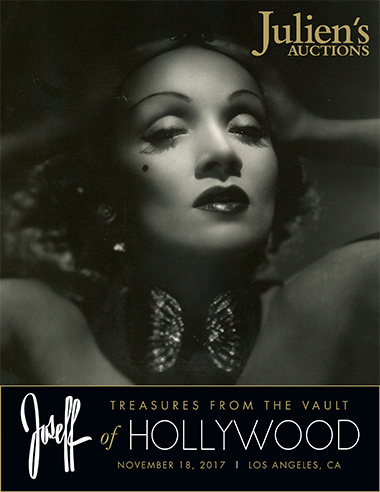 A small sampling of highlights from the Property from the Collection of Joseff of Hollywood include a brooch worn by Marlene Dietrich in Shanghai Express (1932), a pair of earrings and ornaments worn by Greta Garbo in Camille (1936), a necklace worn by Vivien Leigh and a cigar case used by Clark Gable in Gone with the Wind (1939); a pair of earrings worn by Marilyn Monroe in Gentlemen Prefer Blondes (1953), and a pair of earrings worn by Marilyn Monroe in Some Like it Hot (1959).